Mating of adult mayflies usually takes place shortly after the final molt and in the majority of species is followed sh ortly by death. The time of death after mating may vary, for example males and females of the Hexagenia genus may live long enough to mate on two successive days, whereas mayflies of the Tricorythodes last only four to five hours(Leonard,1962). Mating is preceded by a male mating flight in the late afternoon or early evening. Males fly upward and forward for a short distance and then down towards the surface of the water. When the females join in the males approach them from below and grab on around the female thorax using their elongated legs. The two fly up and down until the mating act is complete, the female is let go of by the male to go lay her eggs and die. 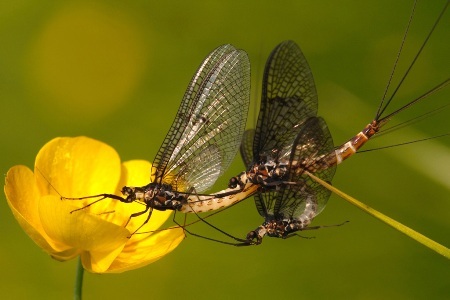 Actual mating is not as well coordinated as all of this makes it sound, the act of mating for mayflies takes place in large numbers and is a sight to see. Dispersal of eggs may fall under four categories depending on the species. One way is for the female to drop her eggs from paired oviducts in two long packets from around her foot in the air. In another method the eggs are protruded in a rounded mass several feet up in the air in a dive bombing mode of flight. A third mechanism for egg dispersal occurs when the female flies low to the water surface, bumping her abdomen on the water several times releasing a couple eggs each time, and the fourth way the female mayfly may disperse her eggs is by crawling underwater on a submerged object and releasing the eggs while submerged. 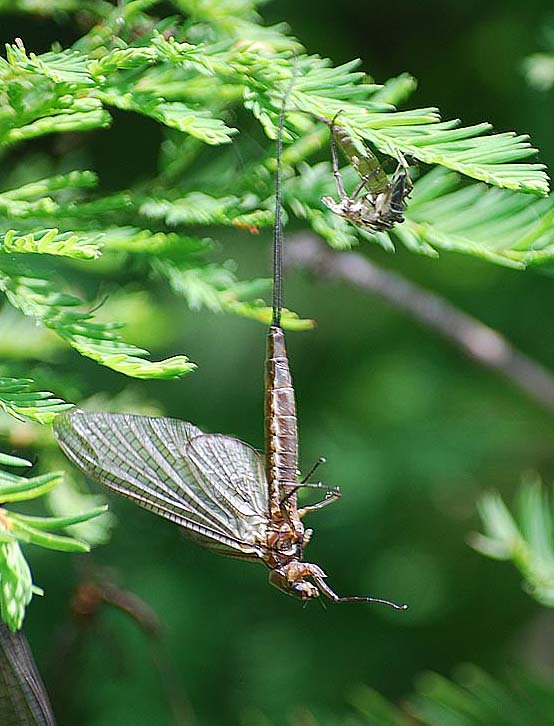 Once they eggs are released, the mayfly life cycle is under way. 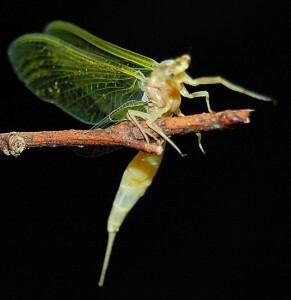 The mayfly life cycle consists of four life stages: egg, nymph, subimago, and imago (adult) which is the form people are most familiar with. Eggs are laid by the female and vary in size, shape and number. They can be ellipsoid, ovoid, or rounded, and can range in width from 0.03 mm to 0.07 mm (Leonard, 1962). In terms of numbers, a female can lay up to around 7,500 eggs with an average of 4,000 (Leonard, 1962). The eggs are released into the water where they either stick to the bottom of the lake or attach to an object on the way down. Hatching (after about two weeks) gives rise to the nymph stage of the life cycle. The nymph lives under water until it is fully grown and recognizable as an insect with three pairs of jointed appendages attached under the thorax. Once this growth is complete, the nymphal skin splits (growth via molting which is characteristic of arthropods) and the subimago (winged form) emerges. The subimago then flies from the water surface to a sheltered area where it will rest and eventually molt for the final time into the imago (adult) life stage. Duration between the subimago and imago stages varies depending on the species and can be affect by weather. Here is an excellent video showing the complete life cycle of these flies. 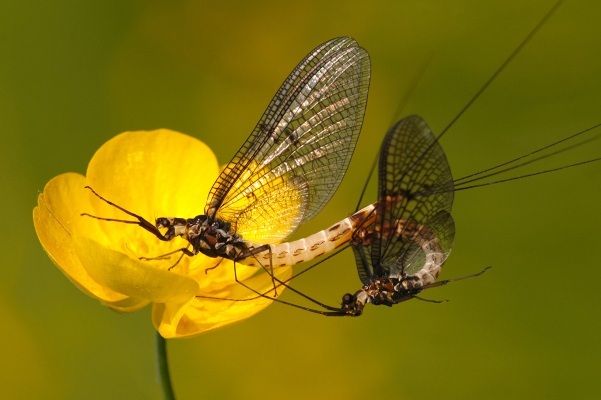 Now that you have an idea about the mayfly life cycle and how they reproduce check out the interactions page to see what other kinds of organisms these creatures have an impact on!